Tiger Balm It can be used during warm up before exercise or to ease soreness after working out , Warm relief for muscle pains, Can be used in itching due to insect bites , Quick and effective, Fast acting pain relief properties . The warm variation of the classic tiger balm muscle pain relief ointment is ideal for soothing muscular aches and pains. This muscle pain relieving ointment also works fast to soothe itch due to insect bites. Rub over affected area to reduce aches, swelling and other discomforts quickly and effectively. Description Tiger Balm Red Ointment 19g jar. 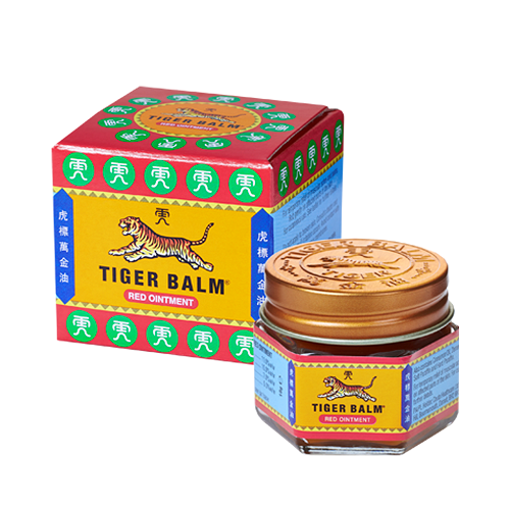 Tiger Balm Red has an aromatic formula which helps soothe sore and aching muscles. It is to be rubbed gently on the affected parts of skin as necessary two to three times daily, always read the label before use. Ingredients 11% Natural Camphor, 10% Menthol, 5% Clove oil, 7% Cajuput oil. Also contains - Cinnamon oil, Dementholised mint oil, Yellow soft paraffin and hard paraffin. Usage Gently rub onto the affected parts of thr skin as necessary (usually two to three times daily). Always read instructions before use. Warnings You should carefully read all product packaging and labels prior to use. We take no responsibility for any changes to ingredients or misuse of the product. Delivery & Returns Standard Delivery We aim to deliver orders within 3 working days to the shipping address provided by you in your order if the shipping address is in the UK. For orders being delivered outside mainland UK, this will be longer and we cannot give a guaranteed delivery time due to the differences between carriers. Delivery timescales are estimates only. If you do not receive your order within 14 days of us confirming your order has been sent you must notify us and we will investigate the non-delivery provided. Orders from outside the UK have varied delivery charges, depending on the particular country. Please note that in some instances you may be required to answer product related questions from our Pharmacist as part of the checkout process. Failiure to answer these will cause delays. Please allow extra time for Pharmacy approved products. Delivery charges for orders outside the UK will vary. Express UK Delivery Please note that Express delivery is only available on orders placed before 1pm (GMT) Monday to Friday in the UK. After 1pm we cannot guarantee express delivery, even if it has been selected. Please note that this is not a guaranteed next day service, but is an expedited delivery option. Products which need to be approved by a pharmacist are not suitable for express delivery. Returns We hope you will be happy with any items you've ordered from us, but if you're not entirely satisfied, you'll find details of our returns policy on the link below.